Meguiar's Generic Spray Bottle (32 oz) is the perfect bottle to use when you need to dilute your favorite detailing products. This bottle is color coded and has a label that you can fill in yourself, so you will never confuse this product for another. Use it with cleaners, degreasers, shampoos, clay lubes, quick detailers, dressings and so much more! It is OSHA compliant so it meets all of the government's guidelines for occupational safety. It does not come with a trigger but the DI Accessories Chemical Resistant Spray Trigger is a perfect fit and it is chemical resistant so it will withstand the powerful cleaning agents of any chemical you may be using. 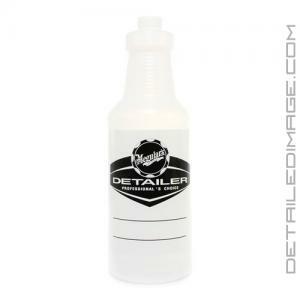 If you are looking for a durable bottle that can be labeled to help avoid confusion then the Meguiar's Generic Spray Bottle is for you. Decided to buy these for my diluted products like waterless wash, Carpro Pearl, etc. Plus they look professional. Great quality bottles. Nice spot to label the product so you do not mix up your chemicals. They look nice and professional too! These bottles are so generic its a crime! You look at them and are reminded immediately of those Wal-mart brand lucky charms "They are Magically Generic!" After doing some soul searching the other night, I decided I needed bottles to dilute my chemicals in. Yeah, we all have those days. But yet, where to find a bottle so pure, so innocent, that it doesn't even dare to carry a name?! I was relieved to find Meguiar's had the audacity to offer the answer to my dreams! The bottle can carry anything from APC to spray wax to military grade chemical weapons (this use not endorsed by Meguiar's). If generic is what you are after, look no further! For you can now have a spray bottle to answer you wildest spray bottle dreams. I suggest you buy a few, as they are addictive.